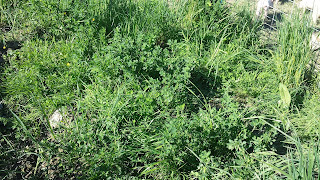 Out in the hayfield the alfalfa and orchard grass are responding well to the weather. Lush growth and lots of it. I never have the weather at this time of year to make grass hay, so I'll be turning the cows loose on it to graze it down a little. Hay weather in a month or so. The cows will enjoy this. 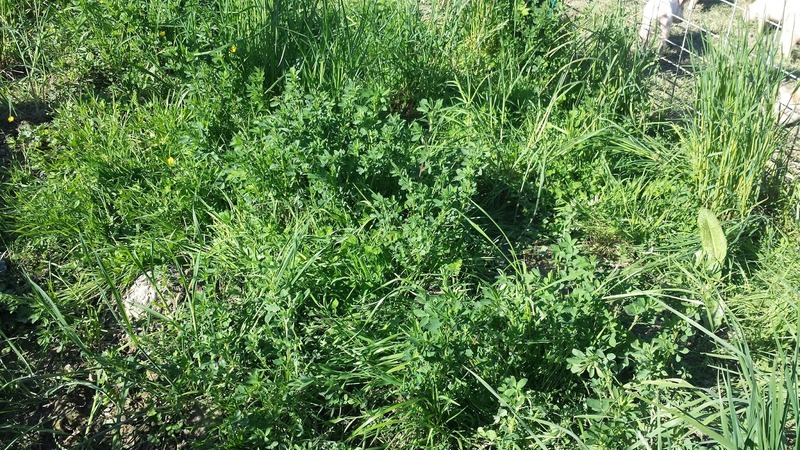 When I planted the vinyard I put down some alfalfa seed between the rows with the idea of grazing it with some sort of animal. 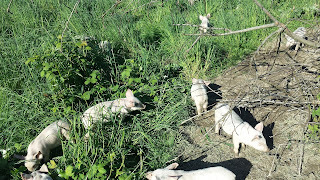 I'm using piglets right now, and the mix is about right, so I'm moving 50 pigs down the rows and they're doing a pretty complete job. Simple pen of hog panels attached with high-tensile coils. 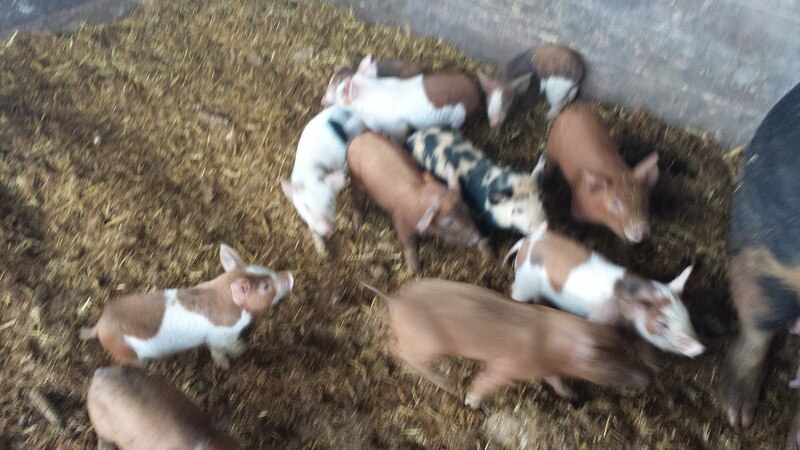 they're pretty easy to move, and for this size pig are more than sufficient to contain them. 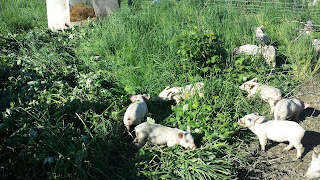 The pigs are doing their part - in this case I'm grazing it down to bare earth, and planting buckwheat every time I move the pen. The buckwheat is good for the soil, good for beneficial insects, and the pigs like it, and it competes well with the alfalfa. 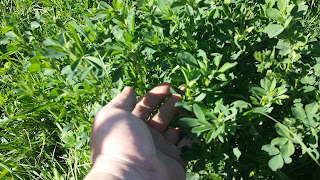 Unlike the alfalfa it's an annual, so it'll go back to alfalfa mostly next year. If you look at the top of the photo here you can see the re-purposed calf shelter bedded with straw that I provide to the piglets for shelter. Not pictured is the automatic water and the free-choice food. They will remove vegetation even if they have all the food they can eat. 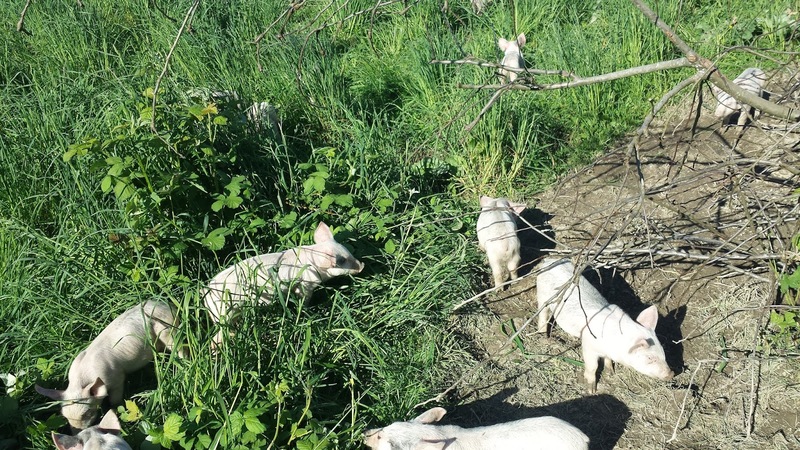 Pigs like a varied diet and they love to be on the ground and moving dirt. So they till it up and weed it for me in one pass. The final weeding for the grapes is to get the weeds that are in the row, between the vines. I haven't figured out a way to do that with pigs, so I do it the old fashioned way - with a hoe and a book on tape. Kinda routine, relaxing word. good way to commune with the vinyard for a half hour a day. 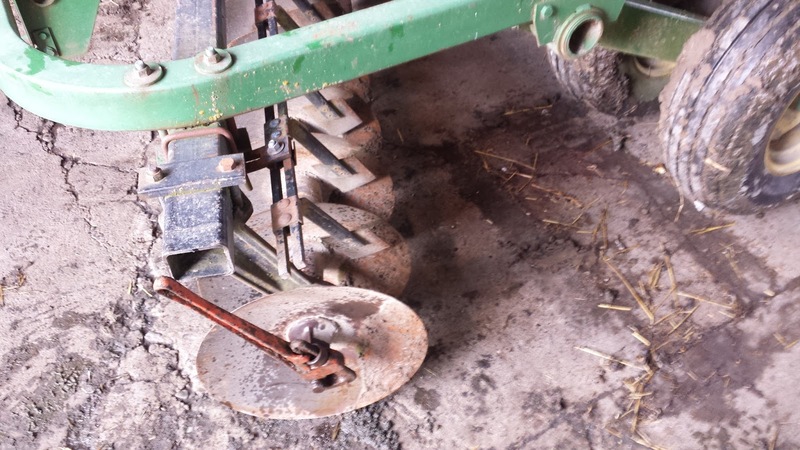 It's that time of year again, and I'm inspecting the disc harrow prior to using it for this season. I know that it needs a couple of bearings replaced, and I give it a once-over to see what else needs to be fixed. 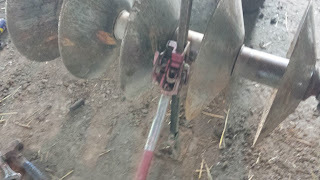 I use a yellow pad and jot down everything; scrapers need adjusting, bearings replaced, triangle warning sign on the back needs to be replaced - it's really faded and I'll be on the road with this implement - and I need to replace a red reflector on one side, also for road use. The disks are mounted on a square stock axle with a couple of nuts on the end holding it together. So to fix the bearing you have to remove the jam nut and then the retaining nut, and then start sliding the disks and spacers off the axle. One of the bearings I was replacing was on the nut end of the axle - which made it easier to replace. It's hard to tell sizes here - the disks are about 24" tall, so that pipe wrench in the first picture is a pretty big wrench - maybe 24". I need the length because they're on tight, and rusted. Some oil and elbow grease and things come apart. The new bearing comes with a gasket, and I inspect the kit carefully. 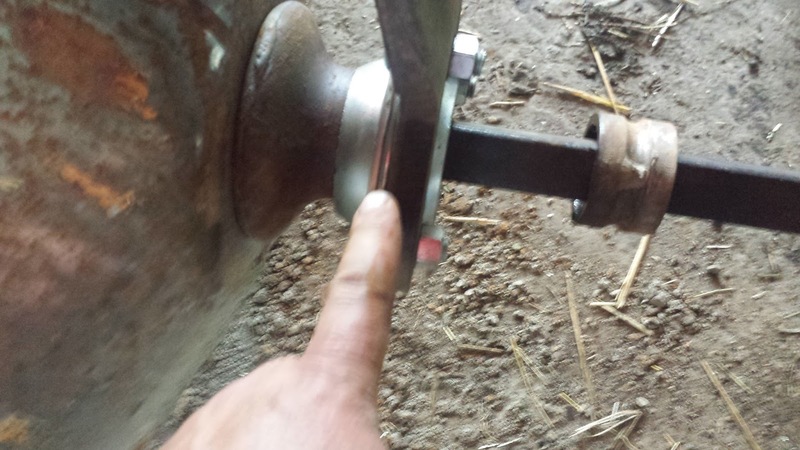 Some of the bearings on agricultural equipment are elliptical - the outer case is not round, and sometimes there's something you should know in the parts. There are no instructions. In this case one of the bolts that holds the two bearing cups together was about half the lengthe of the other three bolts. That one goes down. got it. I replace the bearing on the nut side, and move on to the second bearing, I take the whole thing apart and pull the axle out, and then thread it through the new bearing, and get it all back together, but I'm short about 2". Where did I lose the 2"? I look at the bearings, the discs, look to see if I'm losing space between the discs - cannot figure it out. Until I spot what's in the picture above. When I removed the axle I neglected to remove the old bearing run. So i have to take the whole thing apart again, remove that bit, and then put it all back together. So that killed 90 minutes. 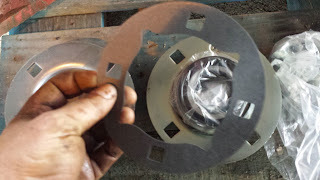 the disc assemblies are very heavy - maybe 250lbs or so, and since I'm working on it suspended in the air I'll place a block or jack to stop it from falling on me. These things are sharp. Once I get the disk axle back in shape I put the scrapers back on. You can see them in the first picture - they're blades that scrape the dirt that collects on the disk off, and are used when you're disking wet or clay soil - they keep the disk from clogging up. Since I'm working with them I inspect each blade and respace a couple of them, and then go over the other 4 scraper units and adjust those. that done I grease all of the bearings, new and old, replace the triangle reflector, and I'm done. I spin each assembly to make sure that they spin free and easily, and nothing is scraping, and then pull the disc out of the barn, fuel and grease the tractor, and then check the oil. Ready to go for tomorrow. 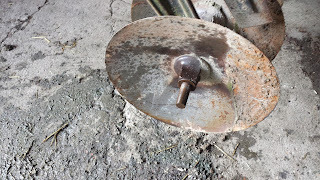 I try to do the maintenance of the tools in the winter, but it seems like there's always something that needs to be fixed. Next implement to inspect is the plow, and after that the planter.